Taiwan-based Ming Shyang Embroider Threads Co., Ltd., a major player in the polyester and rayon embroidery threads industry, is focusing R&D activity on producing stronger varieties to match the new stitching speeds of machines. We import high-quality rayon filament from Germany, Sweden and Japan; polyester filament from Taiwan, Germany; and dyestuffs from Europe and Japan. We have a high level of productivity, using semi-computerized machinery, computerized color-matching and stringent QC systems. Products undergo QC checks on tensile strength, elongation, color fastness, and resistance to UV rays and abrasion. Apart from a local plant, we've set up an factory each in China and Malaysia with a total workforce of over 300. 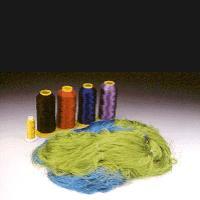 Overall, we turn out 80 metric tons of embroidery threads monthly against a capacity of 120 metric tons. We also have branches in the united states, Canada And Malaysia.